According to reports, Ekiti State Governor and Chairman of the People’s Democratic Party (PDP) Governors’s Forum, Ayodele Fayose, in the early morning on Wednesday foiled an attempt by operatives of the Department of State Services (DSS) from arresting Apostle Johnson Suleiman of The Omega Fire Ministries Worldwide in Ado Ekiti. A couple of days ago, a video clip appeared on social media where the Senior Pastor of Omega Fire Ministries (OFM), Apostle Johnson Suleiman, during a sermon on January 15, 2017, told his church members to “kill” any Fulani herdsman they see around the church premises. Vanguard reports that the Pastor was in Ado Ekiti for a two-day crusade that was also attended by Gov. 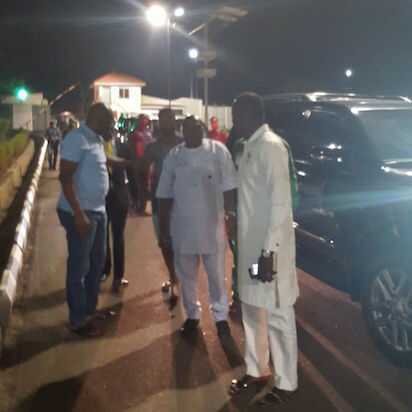 Fayose and he was trailed after paying a courtesy visit to the governor at the Government House. 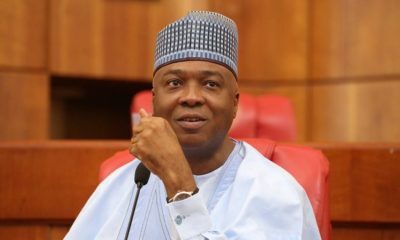 He was trailed to his hotel room by the operatives of the DSS who almost forced their way into his room but were resisted by security men of the hotel that insisted on knowing their mission. The Pastor was then reportedly alerted and he called Governor Fayose who personally led a rescue mission to prevent his arrest and took him to safety. I don’t want to believe that we are now in Islamic republic of Nigeria. This is just too bad; herdsmen continue killing without any serious thing done by the government. We should fold our hands till they start entering our houses . The presidency should tread cautiously : they won’t be able to quench the fire they about starting in this country. Wey PMB naa? E never run go UK… No be you and me still dey for Naija. Nobody dey die for nothing. If dem send you to go and kill Fulani Herdsman or any Christian/Muslim, you are on your own when dem catch you. No be 11 IPOB people wey dem kill on 2oth Jan 2017… Dem kill any Nnamdi Kanu brother or sister? Dem kill any Trump brother or girlfriend? If una like, go throway your life for nothing….O boy, our daily prayer na make God bless our daily hustle make we for provide for our families and make e dey protect us from Ndi ajo mmadu (bad people). Hello Nigeria, welcome to another phase of military rule. This time you willingly sold yourself to a dictator. Nigerians, you’ve played yourselves. It’s gradually turning into an Islamic nation. Northerner Muslim is in power and Nigerjan military is based in the North. So, they have more upper power even in terms of weapons. Inciting violence is a crime. However, whether it’s verbally incited or silently done it should all be a crime. Christians were killed in the North, Fulani herdsmen t killed Igbos and Benue people the government remained mute about it. Hey did absolutely nothing. One of the reasons I admire Fayose is he protects the underdog from this brutal biased dictatorship under Buhari. 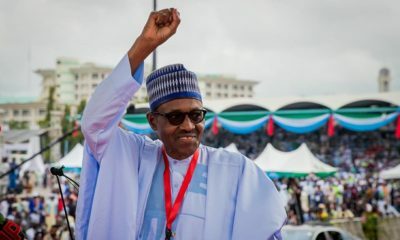 Buhari will die soon, which will lead to another conflict of who will be the next president because the north will want to remain in power, and the VP is Yoruba Christian. God help Nigeria. Suleiman spoke the truth. Do you know how many people the Fulani’s have killed? The government just dey siddon look. Nigeria are in serious trouble ,most especially the Christian. God save this country Nigeria o Lord!!!!!!! Fayose seems to be the only breathing politician. So easy and swift for Pastor Suleimans arrest how about the threat to his life which he responded to? Why didn’t this DSS investigate this threat or do they prefare he bite the dust first? Come on Nigeria! Fayose i thank God for your life for giving us a man like you in the face of tyranny. When a famous pastor said a Muslim cannot rule him, they said he was being a fanatic. When the Ibos said Buhari is bad for business, they asked them to jump into the lagoon. If you voted GMB into power, your decision making skills are questionable because his antecedents were there for all to see. Was it not the oba of Lagos who wanted Ibos to drawn in the lagoon because he wanted Buhari and his likes to come to power. Now it’s affecting every body, not only Igbos. I wrote in my earlier post that that inciting statements from Leaders of the religious organizations send wrong signals to the followers and also amounts to radicalization. Even though his statement (Suleiman) deserves a chat or an invite from the Security Agencies for clarification but the way and manner DSS went about his arrest was inappropriate. He is a “”public figure”” by virtue of his profession and they could have sent him a letter of invitation or except they have sent and he did not honor it. The Leaders are not showing good examples but I am afraid of negative energy among us the followers… There is so much tension in the North and also in the East. My daily prayer is for God to take control, Let us think about the future of our Children, the innocent ones before we engage in any unnecessary call for bloodshed. 1967 – 1970 is still a fresh a wound…… Let us downplay violence and hate speeches. The Rich among us have investments abroad & Dollar ATM cards and only need an hour ride to Cotonou in the event of any war in Nigeria, It is you and I (the masses) with our Children that will face the missiles, bullets, mortars, bombs etc. All the security parastatals are headed by Muslims. From chief of army staff to police to customs and what not. Buhari we would share Nigeria nobody is leaving anywhere for anybody. I support fight against corruption but this is a no no. What happened to inviting the man for questioning? A lot of people are being killed in southern kaduna and arround Nigeria by this ruthless herdsmen no action has been taken or yet it’s sluggish. This is RELIGION we are dealing with tread cautiously. Evil men prevail when good men do nothing……….Is it that there is no one in power that can stand up for Christians??? Its because we all know what the outcome of war is like …i guess thats what is keeping majority of the populace quiet and a small sect of people are just running crazy perpetuating evil acts all around. Even if the sermon was wrong on humanitarian levels but what is being preached to these herdsmen and boko haram members is not any diff. WHAT IS THE SOLUTION TO RESOLVE ALL THIS? It was in times like this that Queen Esther said if I perish, I perish. I wonder what Osibanjo is doing? He should stand for Christianity or resign. If I were him I will resign and stand with my people. Any position that threatens my faith in Christ calls for my resignation. No one has monopoly over violence….this happened during the civil rights era….made the Oppressors aware of what TIME it is..
Fayose for all his faults is taking this fight to Buhari…too biased and silent when Fulanis go on a rampage…primarily for land grab…expansionist agenda..
Look at the number of Xtians killed in the North enough is enough..
It’s time for an open dialogue….this would not be swept under the carpet.. They all have to be brought in for serious sanctioning, believe me all of that will stop. I think it’s very wrong for DSS to go after Apostle Suleiman. How many fulani herdsmen have been arrested since they started their mayhem? Are we Christians going to sit back and wait till we’re all butchered? What nonsense! The government is yet to prosecute any Fulani herdsman. We are yet to see these culprits paraded on our screens. Christians have been pushed to the wall due to the antics of these barbarians. So a speech has greater influence than Fulani barbarians going around Nigeria and killing innocent people? I really want them to touch this guy, let me see if Christians will take a docile position and be looking like mumu. One day this demonic association called Nigeria will break up. Why do DSS arrest at mid night? This shows that the arrest of those , judges are not as justified by DSS. Also it shows that they were instituted for the persecution of Christians and people who may express their dismay on the present administration demonic polices. This man is asking members of his congregation to kill any “Fulani herdsman” they see around his church and people are saying nothing should happen to him. Oga Soyinka, I think religion has already killed Nigeria. So na religious war we go soon enter now. Peace loving christians against peace loving muslims. Anybody wey do us this thing, e no better for am. I commend Governor Fayose for preventing these jobless members of the DSS from arresting Johnson Suleiman. After all, the man has not broken any laws. he was on only exercising his fundamental rights under the Nigeria Constitution.. Freedom of speech is guaranteed to all Nigerians under the 1999 Constitution. However provocative or insightful his comments may have been perceived to be. After all, no member of his congregation has committed any killings on his behalf. Unconstitutional Policing and arrests must be stopped in Nigeria at all costs. A word is enough for the wise. I’m just saying. How about what they tell them to do in their various mosques.. I cry for Nigeria anytime I realise Buhari claims leadership over a country inhabited by humans and not cows. What do we all think will come from this country? How will anyone fight for Christians when Christians calls politics a dirty game they should not involve while they leave the dirty game for the dirty Muslims who want to play? Even the Christians who involve themselves are just like cows tied and led to the slouter house. Who will save Nigeria? Where did we ever go this wrong? Next time, Nigerians will understand better. What a lawless country, for years Fulani herdsmen has been killing innocent souls nothing has happened, now just a mere talk in church, it calls for arrest. Everyone that. Is behind all the blood shed and evil attack, hence forth, the herdsmen will attack you, you will eat your own flesh and drink your own blood. You have drawn the line. Death is your portion for all your evil works. May the God of heavens avenge for His people. Why are Nigerians always heading the wrong way,people talk about freedom of speech but it ha’s consequences the way this pastor is preaching that people should kill fulani heard’s men that is exactly how boko haram leader “shekau” started his preaching and now Nigeria is seeing the consequences how can the governor call this man a man of God,I thought we Christians move along by what the bible says did jesus and the bible say we should kill any fulani heard’s man we see just because “some” people who come from his tribe kill others I am very sure if Nigerians are refusing to see the right way that means their main mission is to kill and start a war and at least the government has tackled some problems that the past government was not able to do so,before terrorists kill thousands but now is no more the 200 cibok students that were missing the DSS has been able to track 21 of them Down.people may think I am a Muslim that’s why am saying this but I am a son of a pastor.so I pray god to help this government achieve the goal of tackling Nigeria current situation in jesus name “amen”. It is a pity to that tribe called afenifere.This time the war will start in the south west full time. Watch out.